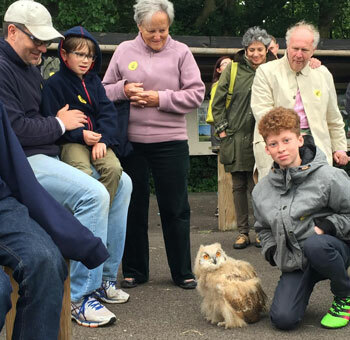 Tura is a captive-bred Siberian Eagle Owl who - at just 5 weeks old - has just joined the team at S.O.S. She will eventually take part in our flying demonstrations as an example of an impressive bird from beyond our shores, but will first be imprinted - acclimatised to humans - before taking part. Luckily the sun just about shone on us for a little while this Spring Bank Holiday Monday, so we took the opportunity to take her to meet some of our visitors. What's all this then? Ahh - people! When Matt let her out of the box up at the flying ground, she wasn’t shy to come forward and say hello, running up to and amongst the feet of the crowd, chirping and saying hello to everyone she met on her walkabout of discovery. When in comes to taking part in the demonstrations, Tura's weight will be a very important factor in regards to how she flies. Eagle owls are the largest species of owl in the world, and the Siberian one of the largest sub species. When we weighed Tura for the first time she came in at 4lb 4oz - the same weight as Pungu, our fully grown Bateleur Eagle - and over the next five weeks of rapid growth, she'll probably reach about 9lb - more than a fully grown Bald Eagle! That’s one big owl! Tura meets her public for the first time. Compared to a European Eagle Owl, the plumage of the Siberian is much paler and very beautiful. But looks can be deceptive, as in terms of prey in the wild, they are quite capable of catching prey the size of Roe Deer. However, owls are generally very lazy and much prefer to participate in a simpler and less energy-consuming ways of catching smaller prey. This is known as Still Hunting, a method which consists of waiting for prey to walk underneath where they are perched, and then dropping on top of it. A study was recently undertaken to see how active eagle owls were in the wild, and the results were staggering: female European Eagle Owls were recorded as being active for no more than 8 MINUTES a week, though the males tended to exert themselves hunting a little bit more at 25 minutes each week. At their sorts of flying weights, it's perhaps understandable why the impressive Siberian Eagle Owl chooses to conserve its energy whenever possible!